I few months ago, I finished work on modifying an old equipment trailer to load and transport logs. In the time since I’ve used it a number of times and have come up with a few improvements to make things simpler and more convenient. The first area that I wanted to work on was the top of the arch. I wanted an integrated way to attach the log chains and the winch cable. 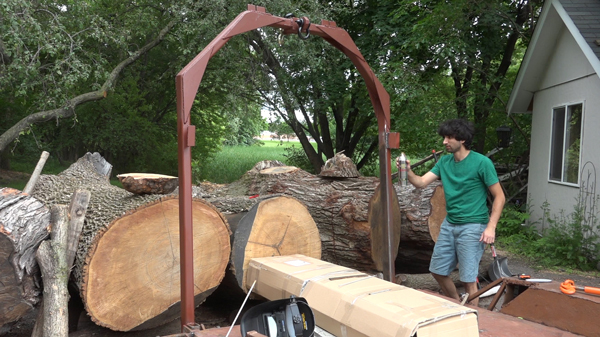 Previously, I would just wrap the log chain around the arch which worked just fine but wasn’t the most convenient. I would attach the winch cable by looping a strap around the arch and hooking the winch cable to that but I never really liked that setup. Although it worked, that strap really isn’t made to do that. So up here on the arch, I’m going to add a pair of shackle mounts to facilitate the hookups. To start, I added a piece of 3/8″ steel to the top and bottom to strengthen the area and further connect the front and back mount. 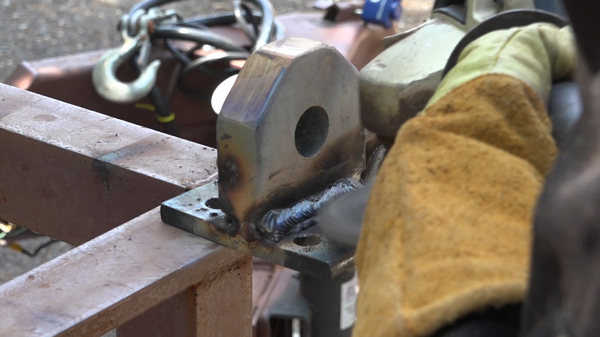 Next, the shackle mounts get welded to a mounting plate made from 3/8″ steel. I welded these in three passes. The root pass was done with 1/8″ rod and the other 2 fill passes were done with 5/32″ rod. I turned the mount after each pass to hopefully even out any distortion from the heat. These things were incredibly hot after I was done welding them and stayed hot to the touch for hours. 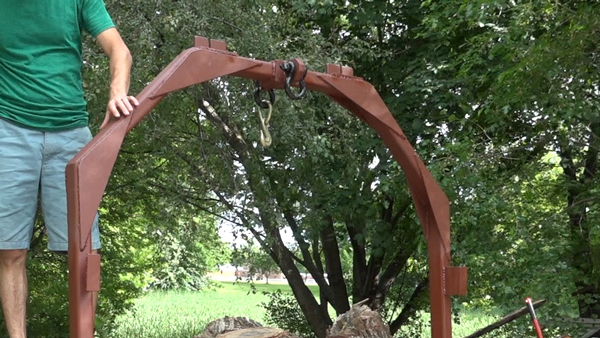 If you’re interested in how I made the shackle mounts, I did an entire video on making them. 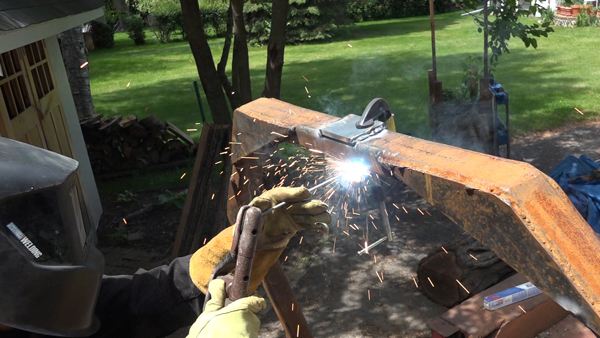 The shackle mount and the mounting plate were clamped into place on the arch and I welded them in place. I welded the mounting plate around all 4 sides and plug welded them where I had drilled the holes in the mounting plate. For the second mount, I folded the arch down onto the bed of the trailer to make welding it easier and for along the bottom, I folded the arch off the back of the trailer to make that spot easier to get to. Next I started working on the chain catchers. 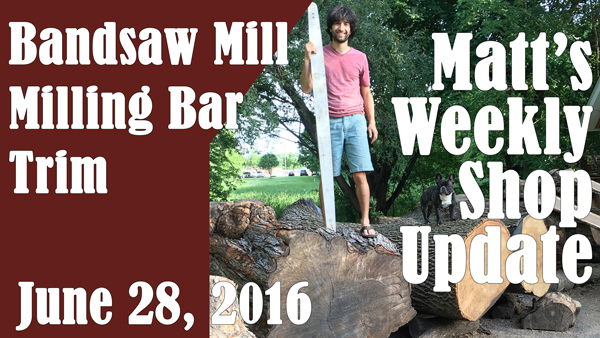 These were made out of 2″ by 1/2″ thick bar stock that I got out of the scrap bin at my local steel yard. I made cuts into the steel about 3/4 of the way through until the slot was wide enough for my 5/16″ chain to slip in. I cut both slots in one longer piece of stock and then cut them apart. I also wanted to use a mounting plate for these so I grabbed the 1/4″ steel that I had left over from making the arch gussets and cut the mounting plates out of that. 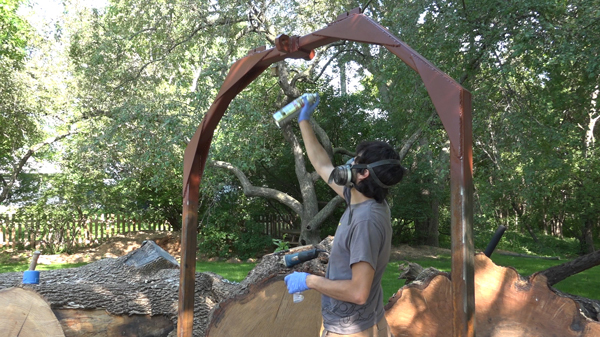 I cleaned those plates up and welded them into place on top of the arch. 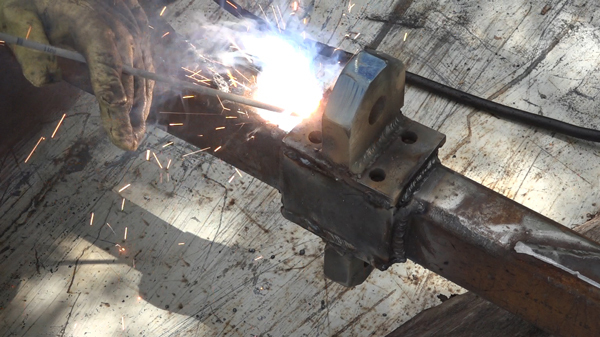 And then I can weld the chain catch into place. These chain catches will either allow me to hold the arch up with a chain if I need it out of the way or I can lift smaller logs to either side of the trailer. I added the other chain catch to the other side of the arch and then I could start prepping this top area for paint I still had some work to do to the legs. This whole thing sat out all winter unpainted so I did develop a little surface rust so I went over everything with a wire wheel to knock off all the rust and debris and then I wiped it all down with acetone. I gave everything a good coat of primer. I still have to apply a top coat but at least this thing shouldn’t rust for a while. 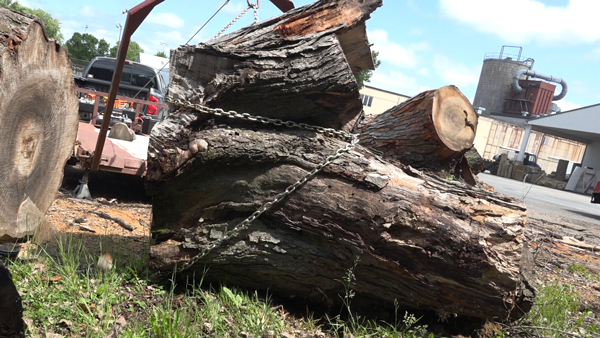 With the new mounts installed I wanted to give them a strength test so I tried to pick up the heaviest thing I had – this 5000lb ash log that I hauled the previous week. No problem picking up one end of this thing. I took the trailer out the next day and grabbed this maple crotch. It’s probably around 1000lbs lighter but the mounts were under more stress since I used the arch to drag this log closer to the trailer before loading it. Next I wanted to add a pair of shackle mounts at the front of the trailer. This would give me an attachment point if I needed to double back the winch cable and also give me some more options for securing loads. I’m going to put these where the tongue meets the trailer frame and I wanted to build out the area a bit so I’m starting by cutting some left over c channel. 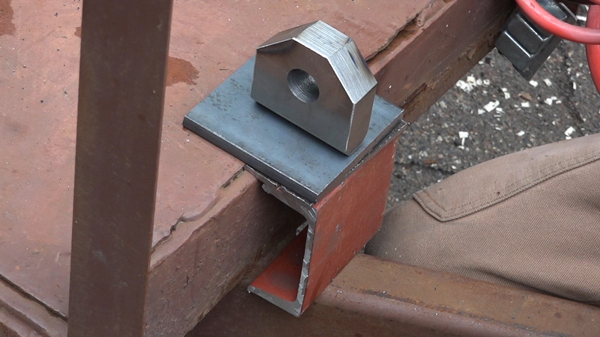 This will extend the trailer frame over the tongue. Next I need some filler pieces to extend the deck. 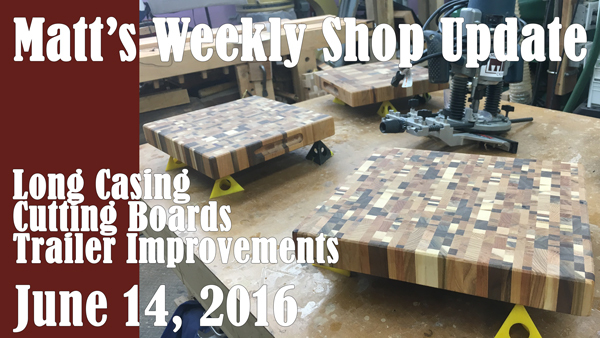 I cut a strip of 1/8″ steel which is the same material that the deck is made out of. This section is supposed to go in front of the winch to fill the hole. I still haven’t decided if I want to install this. So here’s everything laid out. The c channel will get welded to the tongue and frame, the deck fillers on top of that, a shackle mounting plate on top of those and finally the shackle mount. I removed the paint where needed and went to work welding everything together. And I did the same thing on the other side. These took me around an hour each to install. Another thing that I wanted to add to the arch were a set of feet that would support it when it was down on the bed. When I first build the arch and used the ramp mounts, the pivot point was in a location that would allow the arch to sit flat on the bed. The new mounts that I made didn’t allow for that. I had been setting the arch down on the block of wood that’s on the trailer bed which worked fine but always made me nervous when towing the trailer. the arch is always chained down and that piece of wood couldn’t go anywhere but I figured I could come up with a slightly better solution so I’m going to add a pair of feet made from some more of that c channel. I cut a 4″ section, laid it next to the arch, and traced the angle of the arch relative to the bed. 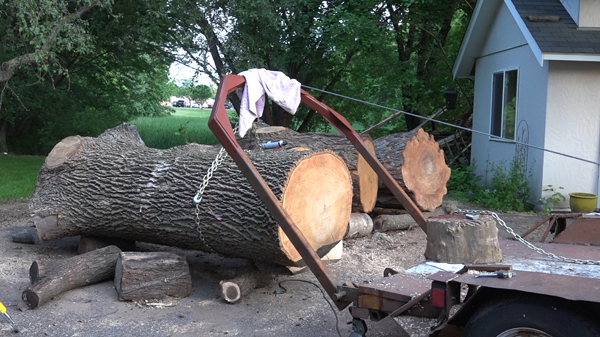 I could then cut to the line, clean them up, set them on the trailer deck under the arch, and tack them into place. Since these aren’t really structural, it was a good time to practice my vertical welds which are getting better but I still need more practice. The first bead i’m running here is with 1/8″ 6011 rod at 110 amps. I noticed the puddle was running so I stopped turned the amps down to 90 and continued up the foot. On the other side, I tried 1/8″ 7018 rod at the same amperage. The welds look nicer but the novice in me still prefers the extra reassurance that a high penetration rod like 6011 provides. And next I can prep and paint the legs to match the top. To support the weight of the logs as they are being lifted onto the trailer, I added a pair of trailer jacks to the rear of the trailer. 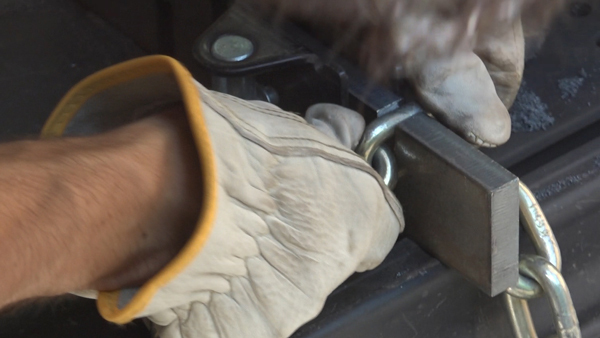 I was previously setting jack stands under the rear of the trailer to support the weight and those worked perfectly. The only issue is remembering to bring them with you. These jacks install really easily. 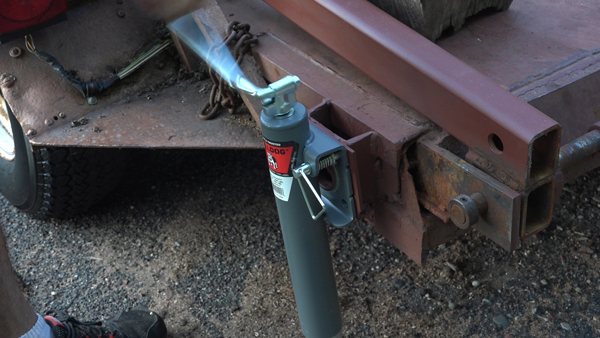 They have a mounting plate that is welded to the trailer and the jack is held into the mounting plate with a snap ring. One last little thing I added is a grab hook and pear link that I can hang from the rear shackle so I can quickly attach the chained logs. Thanks for sharing our project(s). I’m in the process of building a similar trailer. I’m trying to decide on whether to mount the arch at the very end of the trailer like you did or move it up a couple feet. and mount it just behind the fenders. Do you think there are pros and cons to either placement? I can fabricate it either way at this point. Hey Matt do you have a good set of log tongs? I was thinking about building a set of wide mouth ones (+- 30 inches) and was wondering if I could send them to you for testing. Lemme know. I have an inexpensive set that will open to around 30″. I could certainly test a set for you. Really nice work Matt, those shackle mounts turned out really well as did all of your other modifications I really like those jacks you mounted to support the rear of the trailer.